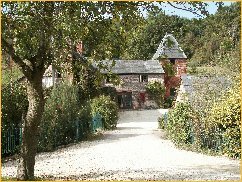 Sue and John Elliott welcome you to the homely Mill and will ensure that your stay is comfortable. The Mill is set in 30 acres where horses, sheep and deer roam, yet you are a mere 30 minutes from the motorway network (M5 & M6) and the historic town of Ludlow, with its castle and gourmet restaurants, is a short drive away. 1 double room with private bath and shower. From A443 (Worcester - Tenbury Wells road) turn onto B4203 in Gt. Witley (SP. Bromyard). After approx 4 miles turn right at crossroads onto B4204 (SP. Tenbury Wells). After 1.5 miles, opposite The Fox Inn, take right turn (SP, Hanley William church & Eastham). The entrance to Hanley Mill drive is on the left after approx 2 miles at the white rail fence and bridleway sign.